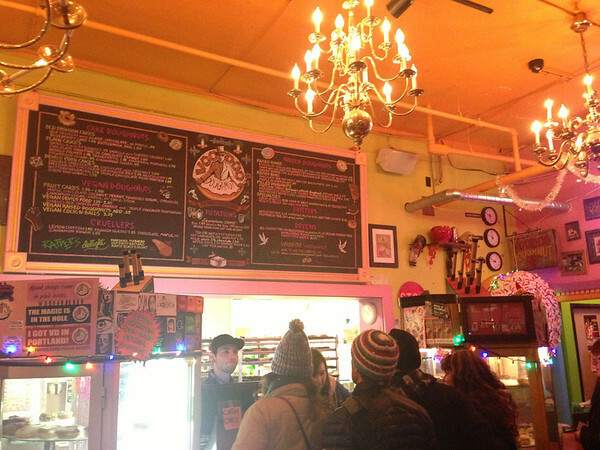 Voodoo Doughnut is pretty much a must visit for the first timers in Portland. It’s not your regular Tim Horton’s. I would say it’s a funky little place hidden in the gateway to Chinatown. We went at night and it didn’t seem to be your safest neighbourhood with bars and pubs on New Years Eve. But despite being NYE, they are opened till they are sold out (which is estimated to be 2-4AM). And on a normal day, they are never closed! Amazing how a doughnut shop can sustain itself like that. It was around 10PM when we went in, and there was a line up (luckily not out the door). 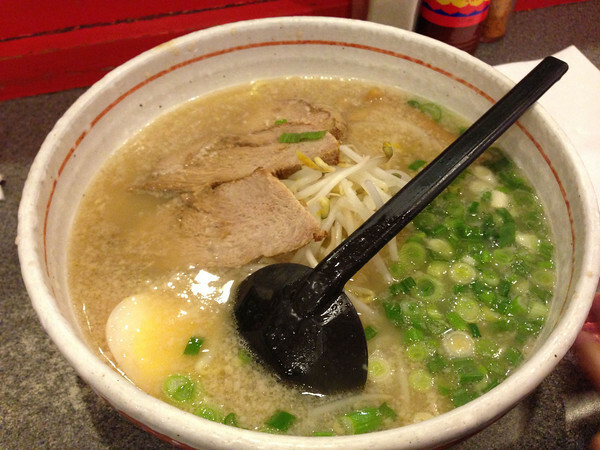 We studied the menu for awhile before making our order. It wasn’t the easiest to study. There wasn’t really a place for you to sit, Voodoo was more of take-and-go kind of store. So that’s exactly what we did. 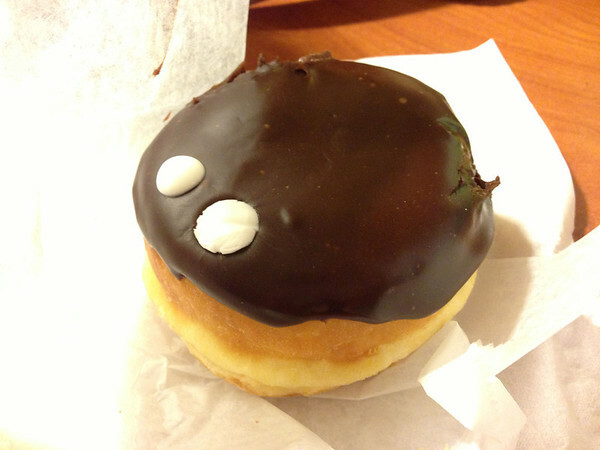 The ladies got the “Portland Cream”, a raised yeast doughnut filled with Bavarian cream. 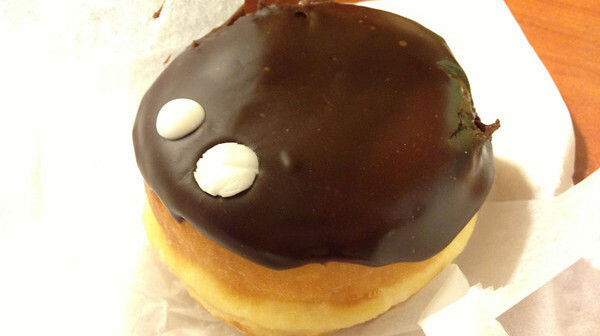 Topped with chocolate and two eyeballs, which represents the vision of Portland. As guys, we could not resist anything with bacon! 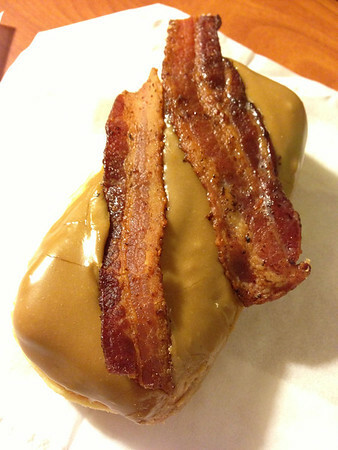 The Bacon Maple Bar is a very popular item on the list, a raised yeast doughnut with maple frosting and bacon on top! At first, I thought it was quite an awkward combination. But after taking the first bite, it was such a perfect match. It wasn’t too heavy, the bacon was crispy and mixed in quite well with the maple glazed. 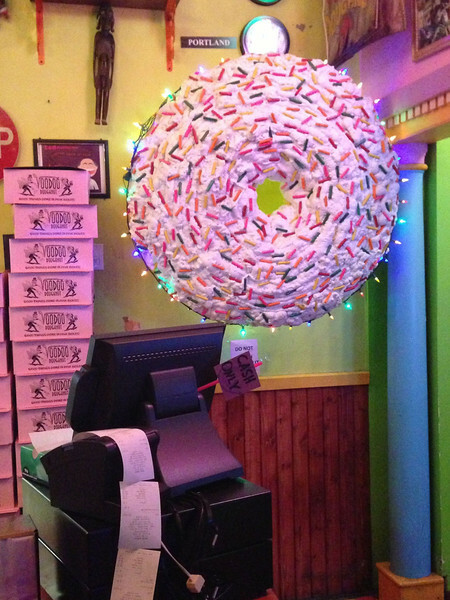 So which donut is your favourite at Voodoo? 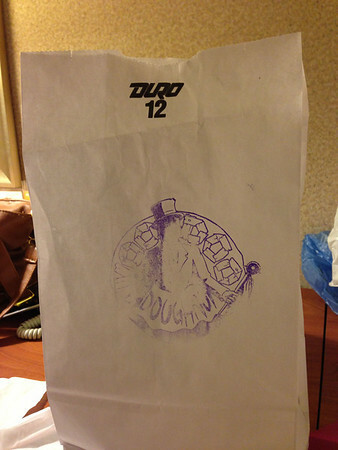 Or if there is a doughnut shop in your area, let me know where and what’s worth trying?